Even though the month is over now and the main event ended with the guest posts, there are a few things I wanted to post before it’s officially over and I go back to writing book reviews (and getting caught up with some of the books I didn’t have time to read while the event was going on!). 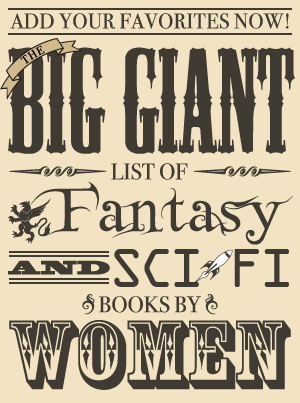 The first of these is resources where you can find more science fiction and fantasy books written by women. Most of these have been mentioned at some point throughout the month, but I did want to have one post that had a collection of these links. If you know of any other sites that you think should be this list, let me know in the comments! Definition of and essay on chickpunk by hard science fiction writer Chris Moriarty with a list of women who write it at the end. A fairly new site dedicated to reviews of science fiction books written by women in the twenty-first century. Reviews can be found here and you can also contribute by submitting your own reviews. A fairly new site dedicated to reviews of fantasy books written by women before the end of the twentieth century. It’s recent enough that there are not reviews yet, but you can also contribute by submitting your own reviews and adding to the book list. A list of over 150 women who have written science fiction. List of books and authors who write science fiction broken down by subgenre. Dedicated to reviews of science fiction books written by women before the end of the twentieth century. Reviews can be found here and you can also contribute by submitting your own reviews. Here’s a couple that do not exclusively have female-authored books but have a lot of books written by women and are definitely ones I feel are relevant. A site for feminist-friendly fantasy fiction. This is open to submissions for books fitting this criteria. You can read more about it here, but basically the founder of the site wants to create a list of fantasy books that have well-developed female characters. List of authors who write science fiction romance with links to more information on each. It’s broken down by decade starting with the 1930s.